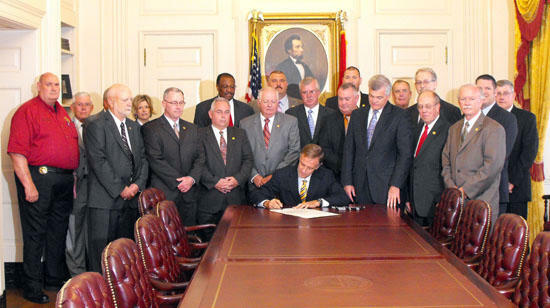 The Tennessee Sheriffs’ Association met with Governor Bill Haslam, Senator Jim Tracy, and Representative Pat Marsh Wednesday in Nashville for the signing of the Sheriff Qualification Bill. “This legislation provides for any candidate to run for the Office of Sheriff to have experience in law enforcement and be certified by the Tennessee Peace Officers and Standards Commission. This is a very important step in further professionalizing the Office of Sheriff across this state” said Sheriff Jeff Long, Williamson County, TSA Legislative Chair. Cannon County Sheriff Darrell Young and Chief Deputy Bruce Kirby were among those in attendance at the signing ceremony. Pictured are Governor Bill Haslam, Senator Jim Tracy, Representative Pat Marsh, Representative Terri Lynn Weaver, Sheriff Robert Arnold- Rutherford County, Sheriff Jeff Long and Chief Dusty Rhoades – Williamson County, Sheriff Terry Ashe – Wilson County, Sheriff David Woolfork & Chief Dan Paar – Madison County, Sheriff David Woolfork and Chief Dan Paar – Madison County, Sheriff Jack Stockton, Chief Tim Phillips and Chief Gavin Morris – Roane County, Chief Nathan Johns and Captain Jimmy Tennyson – Maury County, Sheriff Steve Burns – Greene County, Sheriff Darrell Young and Chief Bruce Kirby – Cannon County, Sheriff Steve Hopper and Chief Eugene Roberts – Smith County, Sheriff Brandon Boone – Clay County, Sheriff Randall Ward – Hickman County.